What has been named one of the most original Christmas markets in Europe is back for the 8th time. Plaisirs d’Hiver will be running from 26th of November right through the festive season to the 2nd of January 2011. 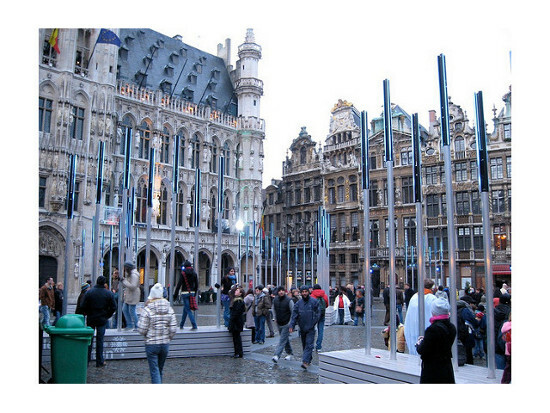 What makes this market so special is that each year the heart of Belgium welcomes a guest country to share in its celebrations. This year Moroccan culture will be blended with a Belgian Christmas, giving you a feel for a hotter climate with all the ‘keep warm cosiness’ that we all enjoy at Christmas. As well as sharing in Morrocan music, cuisine and history there are some returning special features of Plaisirs d’Hiver that are always welcomed back, which you will not want to miss. Winter activities are a big part of the celebration, there is a massive ice rink opened for hand-in-hand skating and for added exctitement you can also have a go on the sledding slope for fast paced fun. The iconic big wheel is back, a 160 foot ferris wheel will give you a lovely view of the city and all the wonder of Plaisirs d’Hiver. Another feature that we think you’ll appreciate is the light and music show put on each evening on the Grand Place which is certainly something special to see. 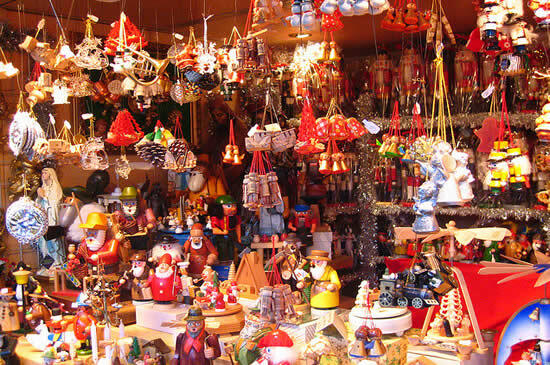 You can get fully in to the christmas spirit and pick up all your gifts at the hundreds of market stalls selling souvenirs, hand crafted goods and much more, or if you are just there for a taste of Christmas beyond Britain we highly recommend you try some of the food Belgium is famous for. It is also the perfect venue to bring a close to the season, you’ll find the market less bustly if you visit after the 25th but still have a great opportunity to make merry – a long walk around the market makes for great post-Christmas dinner exercise. Get to Brussels in time for Christmas or bring the holidays to an end with true festival style this year in Belgium, P&O can get you there! Late last year P&O confirmed the construction of two new additions to it’s fleet of ships and during the summer of 2010 the Spirit of Britain hit left the construction dock and hit the water for the first time. The Spirit of Britain will operate on the Dover to Calais route from January 2011 and has space for up to 1,750 passengers. Inside, passengers can expect to enjoy the new Food Court which brings food options similar to that of the high street, but with a sea view. There will also be new seating areas both in the Aft Lounge as well as a stylish outside deck and Family Lounge. The Dover-Calais route, which is P&O Ferries’ most popular service, takes just 90 minute and there are no baggage limitations – handy if you are planning on going skiing or camping. This ship will offer unrivalled duty paid shopping in even larger on board stores, as well as excellent dining facilities and exclusive Club Lounge. So if you want to be one of the first passengers on this wonderful new ship then book here with P&O Ferries! Although Christmas might feel a long way off we all know how quickly it rolls around, leaving you scrabbling around for last minute presents and wondering how it happened again. So if you’re thinking about visiting some of the wonderful Christmas markets in France and Belgium this year then now is the time to book your trip with P&O Ferries. Right now you can even get a day trip ticket for just £20 for a car and up to nine people. We’ve taken a look at some of the best Christmas markets around and as you’ll see you have a huge choice of specialist markets offering the very best in traditional Christmas entertainment and delicious local produce. Arras is the historical capital of the Pas de Calais region and just a short drive south from Calais itself. 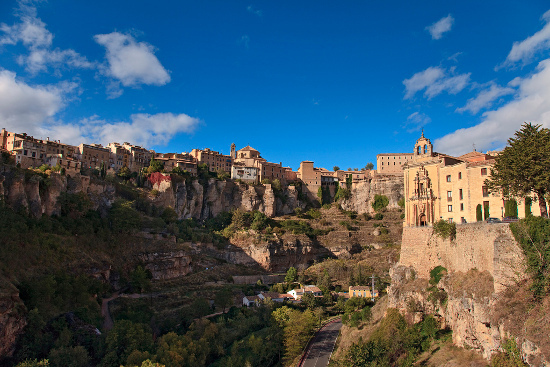 The city has been around since the 10th century and has a number of interesting old buildings including two UNESCO world heritage sights. The Christmas market has around 70 stalls selling everything from traditional food and drink to handmade jewellery and Christmas decorations. There will be a local Michelin star chef on hand with the very best Gallic culinary cooking classes and, best of all; it even has an outdoor ice skating rink. Take a ride in a horse drawn carriage before filling your shopping baskets with original gifts, traditional objects and delicious local foods. This pretty Christmas market consists of 30 little wooden chalets centred around a nativity scene featuring live animals. It’s a lively traditional market that is bound to get the whole family in the Christmas spirit and just a short drive from Calais. Etaples sur Mer is a fishing port just south of Calais, surrounded by rich French countryside. Each year it holds a Christmas market on the 17th and 18th December, but those of you looking for a real slice of French tradition should consider visiting on December 8 to witness the Saint Nicholas Parade. Every year Saint Nicholas parades through the town handing out sweets and chocolates to the crowds of delighted local children who turn up to follow him, along with all the town’s local shopkeepers who also arrive to hand out various goodies. Licques is a town just south of Calais that’s famous for breeding some of the very best turkeys in Europe and each year, just before Christmas, it celebrates this fact with a festival that is listed as one of the hundred best in the whole of France. During the festival you will have a chance to try some of the local Licquoise, which is given to visitors before the procession and there is a regional food market and dinner dance throughout the weekend. It’s the perfect place to buy your Christmas turkey. Holland is the land of eco-friendly cyclists and a champion of wind power but Rosie Khdir uncovers the latest Dutch craze – an Eco Igloo. With about 21 per cent of its population located below sea level, and with 50 per cent of land lying less than one metre above sea level, it is no wonder that the Dutch are coming up with innovative ways to live on the waterlogged land. The Eco Igloo is one of those innovations. The Eco Igloo is a living concept by Intact Ecodesign, an environmentally conscious company that deals in industrial and civil construction. The Eco Igloo has been described as an “amphibious concept for a house or commercial building”. They are designed to be energy efficient with insulated and laminated glass as well as solar panels fitted. 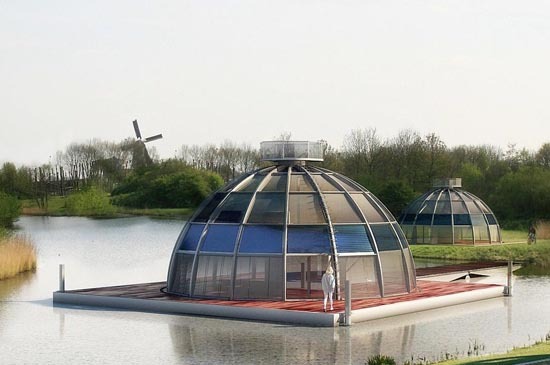 These hemispherical structures are designed to reside on marsh land or even on the water itself via floating elements making them ideal for the water-logged lands of Holland. Intact Ecodesign is hoping to roll out these designs to help people make use of the 500,000 plus hectares of land that has to give way to water. The planned locations for the Eco Igloos include Steiger in Amsterdam, the Blue City of Winschoten and Lake City in Gronigen. If you would like to go and experience a land truly committed to preserving the environment, P&O Ferries can help you get there. You can travel on the Hull to Rotterdam overnight ferry service from £149 each way. You can find some great landmarks in Holland; the Royal Place in Amsterdam, Parliament and the Hall of Knights in Den Hague and the famous windmills of Zaanse Schans. Rosie Khdir discovers yet another gem, the Borneo Sporenburg Python Bridge. This serpent-like bridge was built in 2001 by West 8, an urban planning and landscape architecture firm based in the Netherlands. It was constructed alongside another similarly bright-red bridge, which span the 93-meter-wide Spoorwegbassin. These colourful constructions provide pedestrians and cyclists with a link between the two peninsulas of Borneo and Sporenburg in the Eastern Docklands of Amsterdam. The lower, flatter bridge is for use by cyclists and people with disabilities while the Anaconda Bridge, with its twisted raised frame allows pleasure craft access into the harbor. 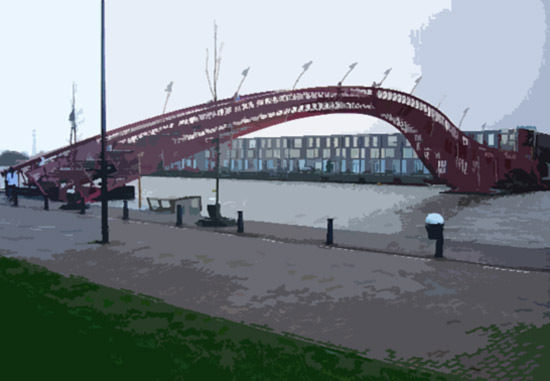 Designed by Adriaan Geuze, these bridges are works of art and vent won the International the Footbridge Award in 2002. If you would like to see these amazing structures for youself then a journey with P&O Ferries. We offer an overnight service from Hull to Rotterdam and from there it is just a short drive to Amsterdam. The handsome and historic city Rouen is an idyllic stopover on a tour of France. It is the capital of Upper Normandy, but once was one of the greatest medieval cities in Europe, a stopgap between the Anglo-Norman Dynasties that ruled both England and France from the 11th century. The River Seine runs through this city on its way to Paris, it has a remarkable history as the site of Joan of Arcs martyrdom, home of William the Conquerors bastion, as well as the birthplace of canonical writer Flaubert. Access to and from Rouen is what makes it such an attractive site for tourists. You can access some of the famous landmarks of France quickly from Rouen’s train station. The Bayeaux Tapestry is just 30 minutes away as well as the D-day beaches, bustling Lille and you also have easy access to the Norman coastline which is well worth a drive along. Though the city took lots of damage in the second world war many of its older structures still stand today. Rouen Cathedral dates back to the 12th century and entombs Richard the Lionheart. Much of the surrounding city has an aged feeling to it due to the half-timbered buildings, it is a true delight to wonder around and absorb the feeling of this historic city. 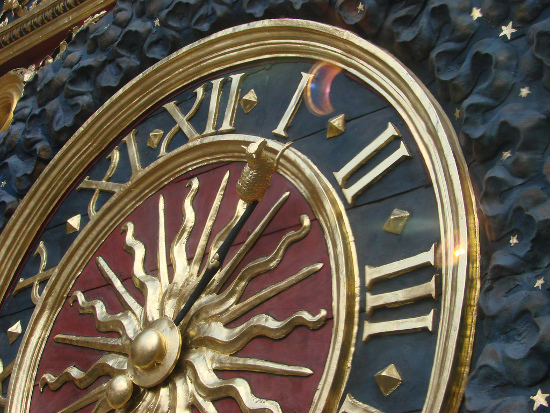 One of the famous sites is the Big Clock (‘Le Gros –Horloge’) one of Europe’s oldest astronomical clocks. It is a piece of the Renaissance that has lasted the test of time. Don’t just walk by and look you can take a tour behind the scenes of the giant one- handed clock-face. As a port of call on your journey around France or just for a quick weekend away somewhere new, Rouen is a wonderful place to visit. There’s much more to see then historic architecture, if you stop by the botanical gardens, and at all times you are just a quick journey away from all the other wonders of France.